Dubuque, Iowa: The NASCAR Dodge Weekly Series was back in action on Fathers Day presenting the fourth weekly racing program of the 2004 season at the Dubuque Speedway The race program was run very swiftly with the final checkered flag of the night waving at 9 p.m.
Steve �Ace� Ihm added his name to the list of feature winners in the NASCAR Iowa Illinois Taylor Insulation Late Model division. Ace took the lead on lap number seven and went to the top side of the track and set sail. Ihm scored the 25 lap feature win over Gary Webb, Jeff Tharp and Jeff Aikey. Ron Barker won yet another NASCAR Modified feature making him undefeated at the Dubuque County Fairgrounds Speedway in 2004. The win was not easy at all this week for Barker as he was locked in a three car battle with Scott Nesteby and Jason Schueller for several laps. Barker was able to secure the lead on lap number 15 and go on to lead the final five laps for the win over Schueller, Nesteby and Mark Schulte. Jimy Brokus used some last lap heroics to score the 15 lap feature win in the NASCAR Pro Stock main event. Brokus was able to wrestle the lead away form Levi Benn on the final lap for the very close win. Benn has been knocking on the door of his first victory the last several weeks but was forced to settle for second on Sunday night. Jason Robbins and Jeff Kennedy rounded out the top four. Jarvis Eastlick took the lead away for Jason Brimeyer with three laps to go in the Hobby Stock feature and went on to score his second consecutive feature win at the Dubuque Speedway. Brimeyer ran second ahead of B.J. Schmitt and Jason Reichers. Travis Law was also a repeat winner on Sunday night topping a strong field of B-Modifieds. Law led the majority of the race en-route to the win. Jake Seegmiller crossed the finish line in second ahead of Bruce VanGordon. Joe Zrostlik completed a clean sweep weekend at the SPI tracks by scoring the 10 lap feature win in the Farley Flyer division. 24 drivers took the green in the very entertaining feature event. Becky Roth ran second ahead of Rusty DeShaw and Brian Kammerude. 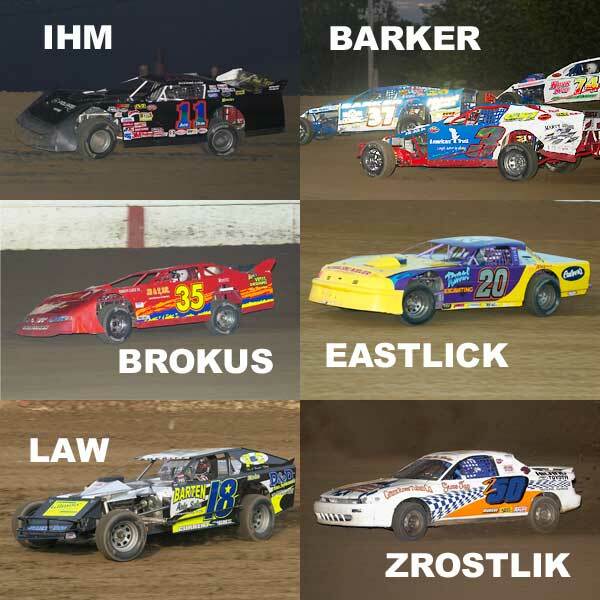 Sunday, June 27th the Dubuque Speedway will host Mid-Season Championships with a 35 lap Late Model feature headlining the program. Hot laps will take to the high banked track at 6 p.m.